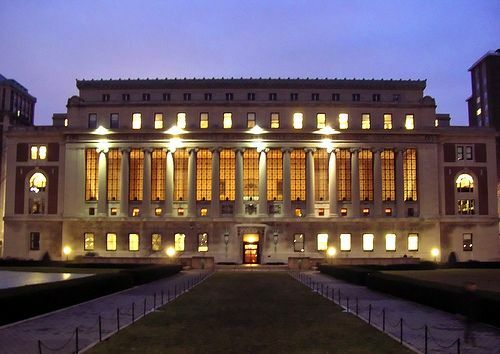 The biggest, largest and most monumental part of Columbia University in the City of New York is Butler Library, home to all of us, our favorite place to chill, hang out and spend nights in. So step into the surprising decent Butler elevators and press the button below the button with the star and transcend into the place which calls “STAFF ACESS ONLY” in large blaring words. Either that or descend the stairs, become Superman, break the super strong doors, and step in. But then thats a bit tough (Dodge might make it possible though). The question arises at this point, what exactly lies there? What is there in the abyss of this really huge tombstone shaped building that we don’t have access to? Is it books? Is it artifacts from Ancient Egypt? Is it sorcerers stones from lost civilizations? Ladies and Gentlemen, the question is, what is hidden down there? Let us guess more! Is it the home of a Satanic Cult ? or of the FreeMasons (ooohh, finally a club more difficult than LionFund to get into) ? or a hidden realm of the mathematically advanced Incan Primates trapped inside ? or a secret study room for the Phd. candidates working on the nucleon bomb with Albert Einstein’s ghost? But wait, did you guys ever think, that does Butler not look a lot like Ministry of Magic? Those red bricks, ornamental wooden paneled rooms? All so palatial, and classically British, that too in the middle of the most happening city on the planet? Is this a door to the other realm, where Harry Potter rules, and Albus Perceval Wolfrick Brian Dumbledore lies dead. But can it be? The question is open. However, we as U Writing students are supposed to be more imaginative, we cannot, I cannot plagiarise Harry Potter, I might get an F and be placed on probation, that’s why I’m going to have to drop the Harry Potter idea. I will just gonna assume that there is a giant world there inside with the 1st floor as its top floor where our dreams can come true and we can descend the steps to the core and meet Brendon Fraser as he is returning up. So guys think and act, think of what is down there, break the door, bomb the wall, who knows? You might just find Batman’s cave or meet the Flintstones. As wild as our imagination might be, I once took the initiative of asking a drowsy eyed gentlemen at 3:33:33 AM what lay down there and his only reply was “Ugghhhh”, a very informative that very specifically defines what creature lives there (a 3 eyed, green pig like dragon that snares and swamps). The next time you see a Ugghhhh, capture it, drug it, catch it and bring it to Prezbo who’ll magically put it back into Butler’s belly and give you a 4 GPA. Next Where is Masturbation Okay?